This year I thought I'd try something a little different. My previous annual updates were done about the same time each year. Things look pretty much the same around the house this year as last. Instead of trying to find yet another different view of green trees and blue sky, I thought I'd wait a little and catch some of the early fall color changes. The trees and shrubs are slipping into their fall colors more slowly this year. We've had above average temperatures during September and the first few days of October. This seems to be confusing the some of the flora on our property. Some are changing now and some are still waiting for colder temperatures. 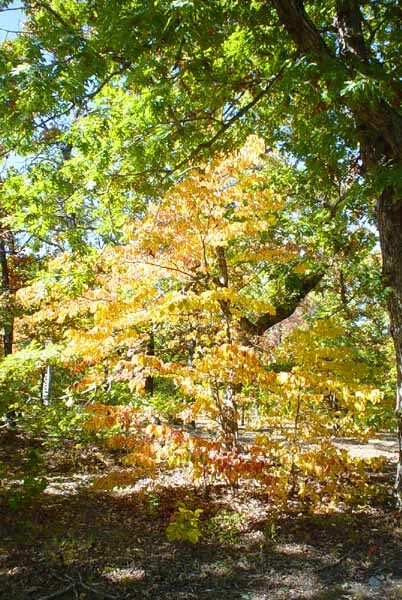 The photo below shows a pretty Dogwood getting ready for winter while the Oaks around it are still green. This shot was taken from our RV parking site back toward the house. Our house is that dark thing seen back through the trees in the lower center of the picture. 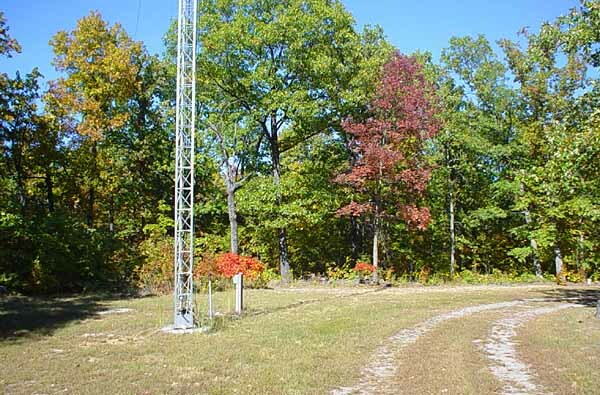 The photo below shows a view looking past my radio tower and the RV site. In this shot you can see the an Ash tree and some Sumac bushes changing color. For a size reference, the Ash tree is a little over 30 feet tall. 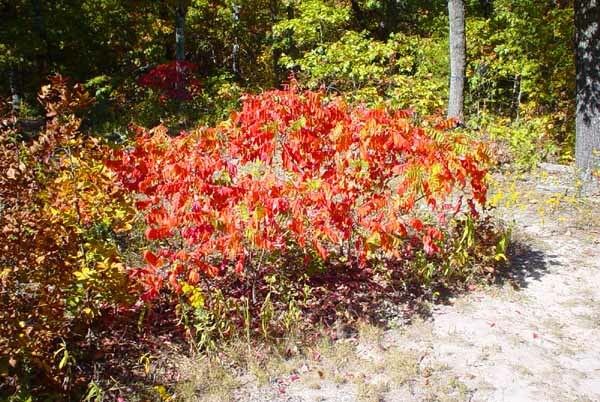 The photo below shows a close-up of one of the Sumac bushes. This picture does not do the colors justice. The reds are very bright when seen in person. Sumac is scattered around our property as both shrubs and trees. This plant is a Staghorn Sumac. Adding to the color show is the interesting variations between plants of the same species. The dogwood below is the a Flowering Dogwood as shown in the first photo above. That first Dogwood was showing a light orange shade. The Dogwood below is showing a more subtle light yellow-pink shade. 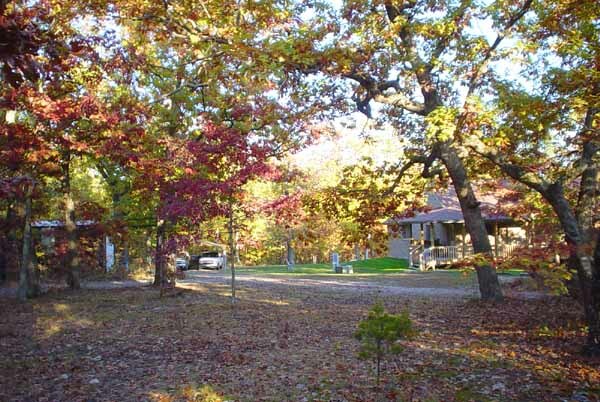 Most of the trees around the house are Oaks. They tend to have an uneven shift into fall. They do not change all at once. 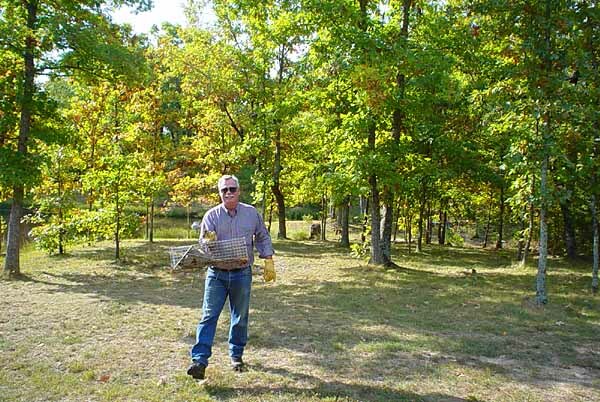 Each tree will have spots that are showing fall color while other spots are still green. This is pretty to see in person. It does not show up as well in a photograph. Well.. In case you were thinking that I did nothing this summer, you were mostly correct. Our summer this year, as was the case in many parts of the U.S., was hotter than average. I'm retired so don't have to work when the weather is hot. I didn't. Once daytime temperatures returned to something closer to normal, I started one of the several projects we have had in mind. 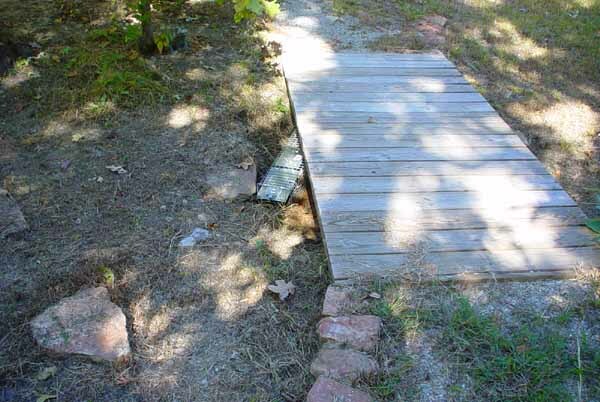 The photo below shows my efforts this year at landscaping the ground by the pond. The area shown below is between the house and the pond, next to the pond. The pond is to the left of this photo. When the pond is full, the water almost reaches the base of the tree at the left side of the picture. 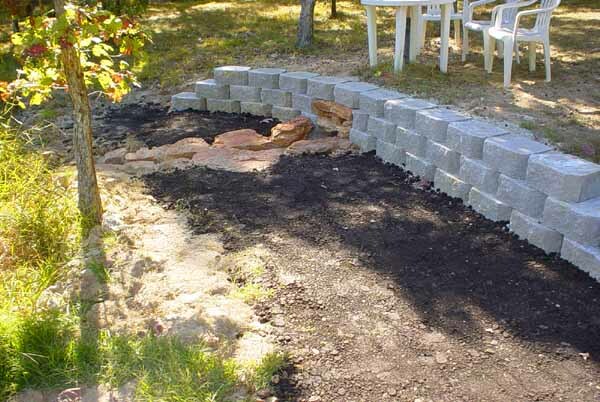 What you see below is a concrete block retaining wall and a stone water drain. The dark stuff on the ground is not asphalt. It is a commercial lawn soil. After excavating the area, all that was left was bare clay that does not work well for lawns. After this picture was taken, I spread the grass seed and added another layer of lawn soil. We are hoping that will be enough to have grass in this area next summer. The stone work was necessary as this is where the house footing drains dump out. Underground, our basement is surrounded by about two feet gravel. This gravel extends from ground level down to perforated drain pipe located below the basement slab level. Any rain water or ground water flowing toward our basement runs down through the gravel, into the drain pipes, and out through the rocks below. We get a fairly heavy flow when it rains. There is a continuous trickle during the spring. Now instead of producing an annoying muddy spot, that water can be part of a yard decoration. This is only the first phase of this project with much more to come next year. You wouldn't want me to rush the job would you? We don't want you to think there were no problems at all here on Coyote Ridge this year. Our major crisis this year (an 0.5 on a scale of 0 to 10) was an armadillo digging in our yard. The trouble with armadillos is that they are very prolific diggers. The one we had could dig hundreds of small holes in the lawn each night looking for grubs and worms. Fall has been fairly dry this year so our pond is down about 10 or 12 inches below full. That has left the upper end of Faith's water plant bog dry. The armadillo liked the protection provided by the bridge so started digging its house there. 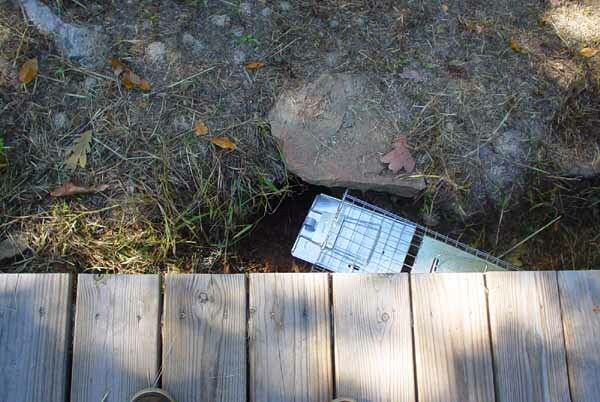 You can see the top of the trap we set to catch the armadillo showing next to the bridge in the photo below. Here is a shot looking down on the armadillo's hole and our trap from the bridge. The hole extends under the rock away from the bridge. You can see the opening as a dark area just in front of the trap. The hole is about 10 inches in diameter and goes back about 4 feet. There is a big pile of clay from the armadillo's excavation that I will have to dig out from under the bridge. This turned out to be one of those cloud/silver lining things though. I was planning to extend the bog trench a bit and the armadillo's digging has done much of my work. Some times you lose, sometimes you win. Fortunately for us, armadillos are dumb. We are not experience animal trappers. We had simply placed the trap near the armadillo's hole. The armadillo could come and go without entering the trap. There was no bait in the trap. It was just sitting there. Any other critter would have avoided it. Of course, the armadillo walked into it. Armadillos are not considered native Missouri critters. They have been migrating out of the Texas towards our area for a long time though. They are not adapted to cold weather so die off in extended freezing temperatures. Last year we had a very mild winter. The local armadillo population survived. They will probably not be so lucky this winter. We felt no need to kill the armadillo we caught. There is enough open country around us that setting it free would be no problem. We took it a few miles down the road and let it out of the trap near a stream. In the center of the photo below you can see the armadillo's rear end as it wanders off down the road looking for a new home. 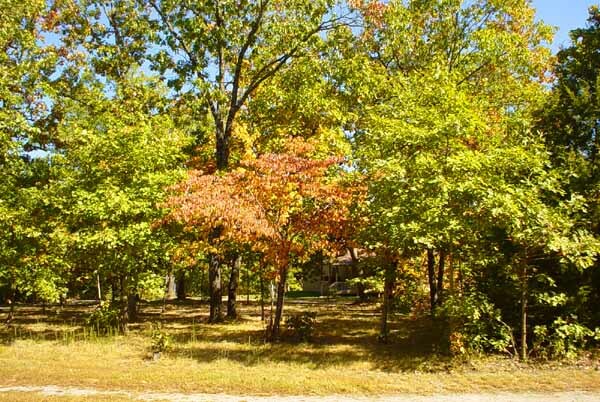 Now we are starting to see some more color in the trees. 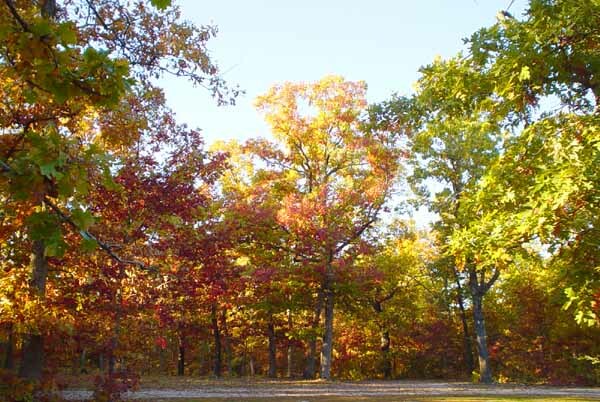 The oaks are starting to show bright fall colors. 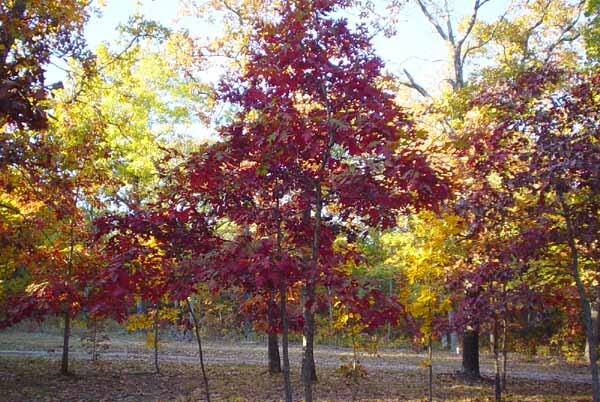 The photo below shows a small (20 ft high) white oak tree with bright red leaves. 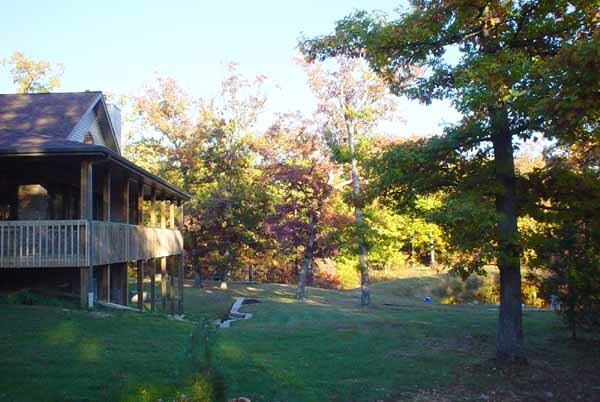 The shot below was taken looking eastward toward the house and barn from the center of the driveway loop. 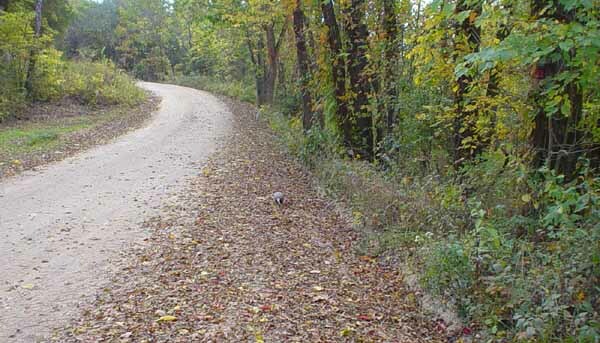 You will probably notice that leaves are starting to collect on the ground. Within a month, I will be lots of use out of my leaf blower. I bought the top-of-the-line professional model from Stihl. Even that is just adequate for the job. From just the driveway loop alone, I end up pushing a three foot high, ten foot wide, two hundred foot long pile of leaves into the woods. The photo below is looking eastward also along the south end of the house. 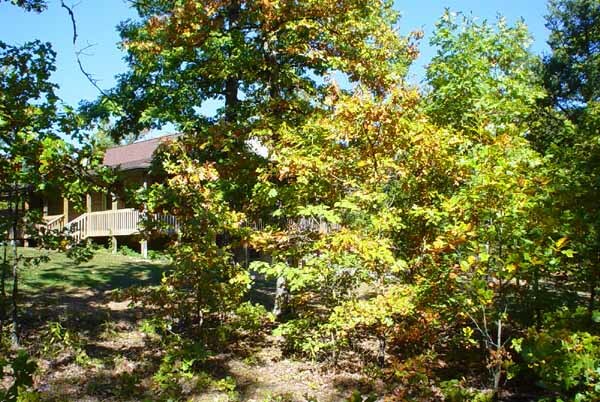 You can see trees reflected on the surface of the pond behind the large white oak at the right of the picture. Anyway, that's pretty much it for this summer and fall. There is nothing big to report. Everything is going very well for us. We had visitors here with us for a total of about four or five weeks this summer. We are enjoying our rural retired life immensely.